Just testing a new baby I've bought. Film doesn't want to coil up as it should. Any ideas? Hi Michael...I had an issue with the take-up chamber when I first got my Pathe Baby. Turned out the take-up hub had become frozen. I resolved it by taking the hub apart and cleaning and lubricating it. Thanks Janice, will check that. 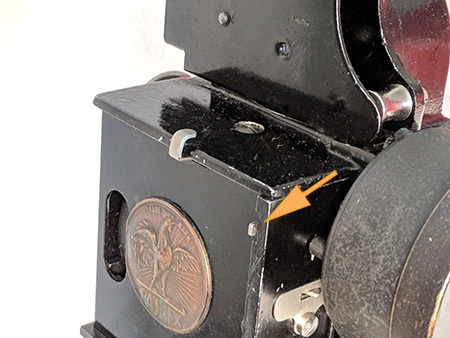 I've also noticed that the sprocket hole is always visible at the top of? the screen, can this be adjusted? Try adjusting the framer lever. Thanks again Janice. I didn't know what that lever was for!